A Chinese microblogger recently noticed a curious architectural object built upon the roof of a housing complex in Shenzhen. 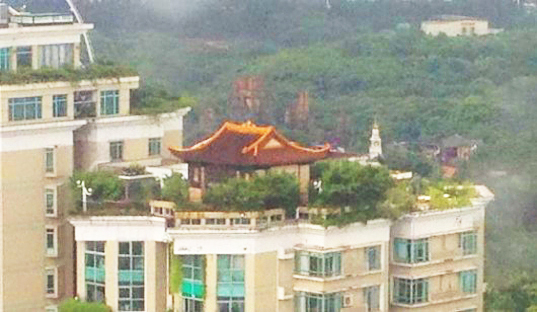 A mysterious temple has been sitting atop the 21-story luxury apartment building in Nanfang district of Shenzhen for at least three years, but apparently nobody knows who it belongs to still. The temple is surrounded by vegetation, has a security system to protect the premises against unwanted visitors, and walls covered in glazed golden tiles. It looks like an out-of-place private facility illegally built on public property. One of several illegally built rooftop structures in China, the temple could compromise the overall structural integrity of the building and put its tenants in danger. The majority of Chinese, especially after the affair involving a mountain villa built on the roof of a Beijing apartment building, feel that the arrogance of this sort should be stopped by the government. An anonymous source reportedly told South China Morning Post the identity of the building’s owner—a piece of information still not officially confirmed.